September seemed like a busy month, I feel like it's gone really fast and now we're almost onto October?! This month was just all about Uni really, with being back from the two week break and everything. The second semester is nearly over though - in a few weeks it'll be exam time unfortunately. But hey - on to better and more exciting things like summer and holidays. In terms of beauty, this month was slightly better than last. There are a couple new discoveries and a couple of things I've had for a while but have particularly been loving lately. The Balm Hot Mama Shadow + Blush is my cheek go-to right now as it's getting warmer in New Zealand and I fancy a coral/orange blush with a highlight rather than a standard rosy pink. I've had this for a while but haven't really used it much. I think now that it's Spring I'll be getting some use out of it. The Rimmel Match Perfection Foundation was repurchased this month (I can't believe I used up a whole foundation though?) so that's why it's here in my favourites. I've tried a couple other foundations, but I always go back to this one. Again, it's a more summery one with a light coverage (also it's pale enough!). 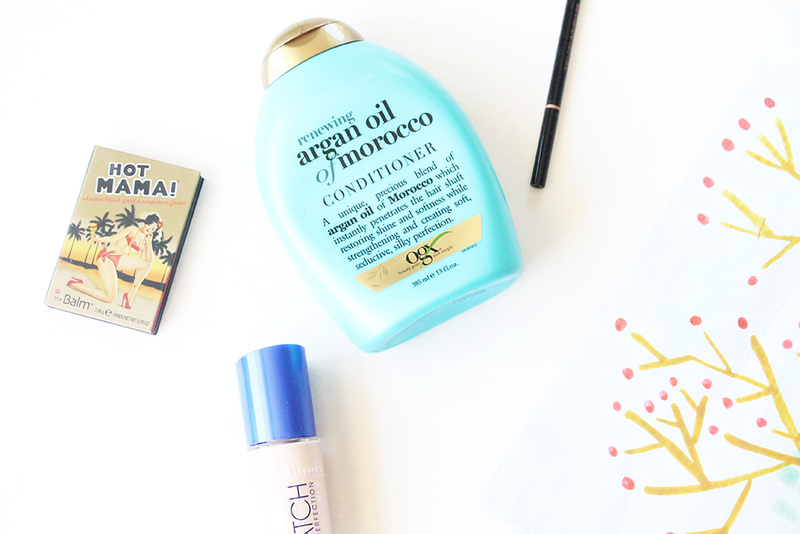 One of the new discoveries was the OGX Argan Oil of Morocco Conditioner. Oh wow, I'm in love. I'd heard a bit about this brand and really wanted to try their shampoo + conditioners. I was going to pick up the coconut conditioner they have but it was sold out in the supermarket I went to. I tried this one and it's amazing. I'd go as far to say it's the best conditioner I've tried. It makes my hair just feel so soft and when you rinse it out in the shower your hair will feel like silk. It also smells really incredible - I'm not sure what it smells of exactly but I like it. Lastly I have to mention the Anastasia Beverly Hills Brow Wiz which I got this month. It just makes my eyebrows look a lot more shaped and filled in. I did a post about the product here so check that out if you want. One thing to mention this month is that the last couple of weeks I've been trying to eat a little more healthier. 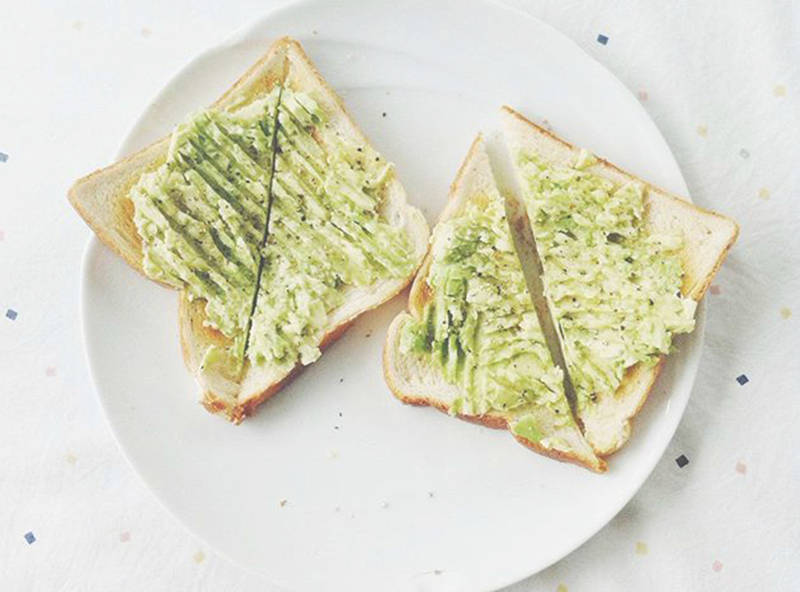 I'm glad summer's coming around because there's all the lovely fruit and vegetables to eat. I've been making smoothies every day or every couple of days and it's wonderful. My new favourite thing is Unsweetened Almond Milk which I have with frozen/fresh berries, frozen mango and frozen banana. I don't really like the taste of normal milk while I do quite like the taste of almond milk. The smoothies are filling and it makes sure you get all the nutrients from fruit (and vegetables if you juice). I've been loving watching Shaaanxo's vlogs because she's inspired me to start being a bit healthier and make healthy smoothies. Here's a shocker for you: I have barely read a whole book this month. I feel so bad! I want to read but this month I ended up not finishing two books I started and then I just managed to finish Am I Normal Yet? By Holly Bourne before the month ended. 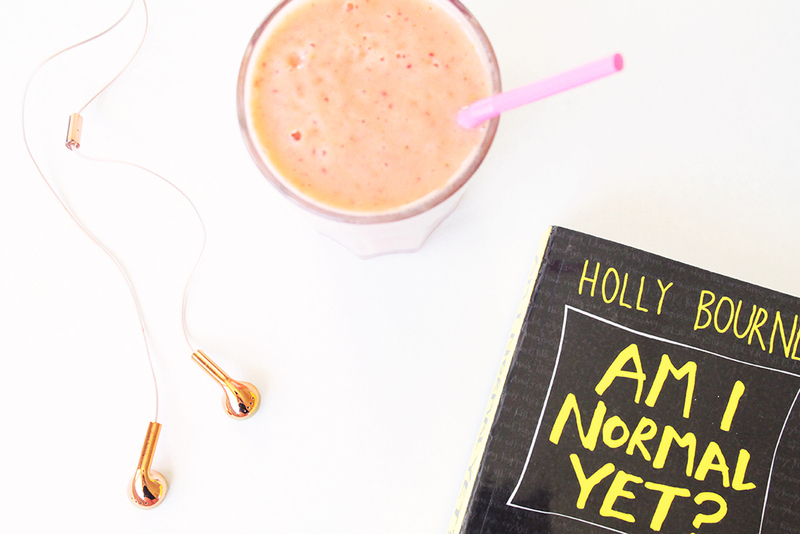 I think this book is my favourite out of Holly Bourne's books. I liked the idea of a story about someone with a mental illness, in this case OCD. This book has lots of stuff about feminism dotted in it too which I found really interesting and refreshing. The way the story was written was good and overall the reading experience for this was (a bit emotional for me) and it was easy to like the characters and get invested in what was going on. This is a pretty rubbish 'review' but I'm bad at describing/writing about books so all I'll say is I would recommend this one if you're a fan of YA fiction! Holly Bourne is a fantastic author. I've also finished my Good Reads Reading Challenge for this year. I aimed to read 30 books, and that's what I've done, quite ahead of schedule. In terms of entertainment, I have been loving watching Netflix documentaries. There's something so interesting about watching them and I prefer it over fiction sometimes as it's easier to watch. Some of the ones I've watched recently are Fat Sick & Nearly Dead, Fed Up, The Queen of Versailles and The True Cost. The True Cost really opened my eyes up to the world of 'fast fashion' and what those consequences can be. So much so that I've decided to do a Uni assignment inspired by it, so we'll see how that goes. I liked all of those ones so check them out if you get a chance! Oscars Hotel of Fantastical Creatures is something I am enjoying watching. If you didn't know, YouTuber KickthePJ created this mini-series and it's currently being released weekly. They are about 10 minutes each and the production quality is really amazing. It costs about $15 on Vimeo but it's worth it because you're supporting the artist and everyone who joined together to make it. As for music, Troye's new music was released this month and my favourite songs are Wild, Fools and Ease. Disclosure dropped a new album and while I haven't listened to it, I'm in love with the song Magnets which Lorde sings in. (Lorde - please make new music soon). The two biggest music happenings of the month were definitely the release of Lana Del Rey's new album Honeymoon and CHVRCHES new album Every Open Eye. I swear Lana needs to come and do a tour in NZ because I would so come. My favourite songs from the album are Honeymoon, Terrence Loves You and Art Deco. CHVRCHES album is so cool, I absolutely love it. My favourite songs so far are Leave A Trace, High Enough To Carry You Over and Bury It. To be honest I love most songs so listen to them all. Hope you enjoyed this post! 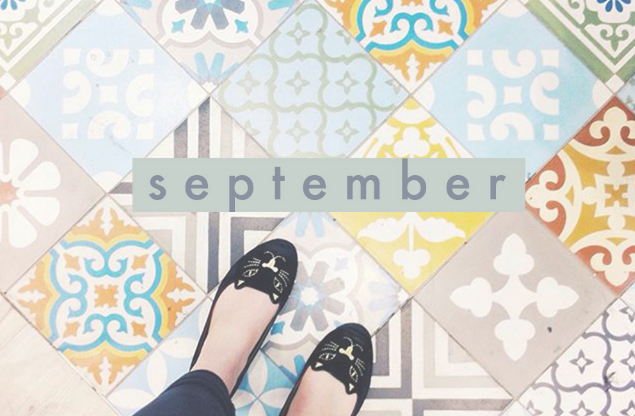 What were your favourite things of September?